i made the mini southport dress from true bias patterns. which is the same pattern i made for etta's first day of school dress last year. the fabric is a lightweight purple chambray I picked up at stonemountain & daughter two weeks ago. personally i love this style. it's exactly the kind of dress i would have worn as a kid: un-fussy, casual, and comfortable. i made a size 6, which will probably be a tad big as maya is quite the penut, but it will allow for growing room. even though i had plenty of buttons that would work, i decided to use snaps instead. the scale just suited the dress better, and to be honest I'm a little tramatized from a recent experence with my button hole attachment. 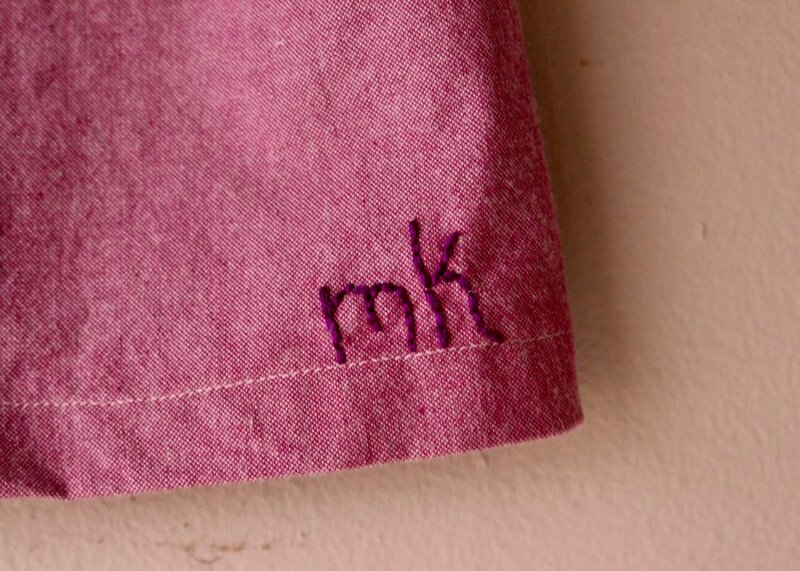 finally for added Personalization I embroidered our initials along them hem. have an awesome year maya, you are going to crush first grade!